The silhouettes are near life-size and can be fixed to a wall or attached to an upright post in public or private spaces. In addition to the iconic image of a 'Tommy' there are equally significant representatives of the members of the communities the nation says thank you to. The silhouettes have at their base the words 'Lest we Forget' but any business or community group can buy and sponsor a silhouette and have its name incorporated in the base wording, as an act of Remembrance and supporting the valuable work of The Royal British Legion. On behalf of the museum Chairman Paul Joseph accepted the silhouette from Peter Buckle. Vice Chairman and Ray Street. Chairman of the Porthcawl Branch of the Royal British legion. 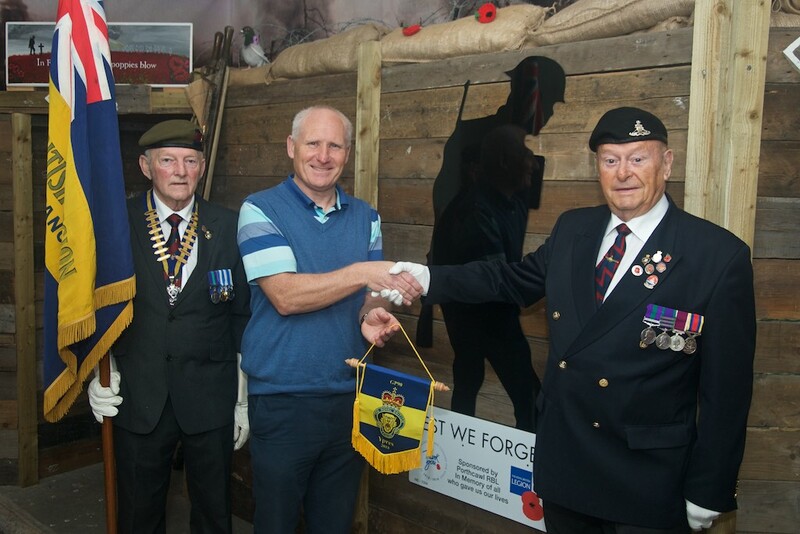 The museum was also presented with a Royal British legion pennant to mark the 90th anniversary of the grand pilgrimage to France and Flanders made by 26,000 members of the families whose sons, husbands and brothers who had made the ultimate sacrifice during the Great War. Members of the Porthcawl branch traveled to Ypres in August to join 1600 standard bearers and wreath carriers from legion branches across the UK. The Porthcawl branch collection for the poppy fund this year the has raised over £13,000.